This week I pinned A LOT of shoes onto my pinterest boards. In fact I pinned SO many I decided to just make a board dedicated to SHOES. There's SO many fun ones out there. Wait till you see! Not sure if I could walk on these! I love, love, love shoes! 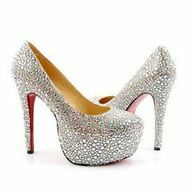 The rhinestone Louboutins are my favorite!! 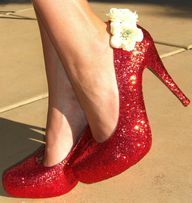 I do love a pair of Sassy shoes! My favorite is the fourth pair down!! 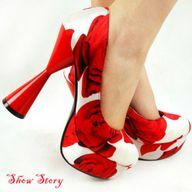 I soooo wish I could wear shoes like that! 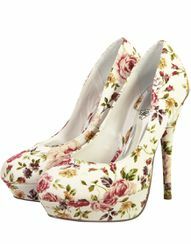 Wow I love shoes to and I have a board of shoes only on Pinterest too. love all the shoes! esp the turquise ones!! Ahh I love the sparkly ones. Thanks for the blog love...following now. Happy Wednesday! I am a shoe lover as well! Those last ones can walk into my closet any ol' day! Wandered by from the Vintage Apple! Thanks for sharing!! Yup. 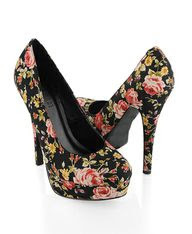 Now I know Pinterest is the best place to find cute shoes. Because, these are AMAZING! I'll have to find you because these pins are ADORABLE! Unless I want to be 6-foot-6, that will just never be a reality for me! :(~ What a bummer! SOOOooo cute! 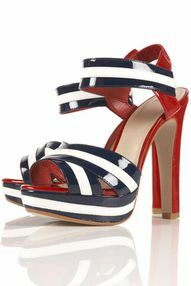 Those red white and blue shoes are H-O-T!!!!!!!!!!!! I have a pinterest acct but I don't use it, I really need to start!! Loving the whites, the sparkly and the last ones!